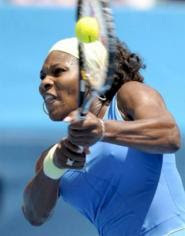 Melbourne, Australia: In Australian Open finals Serena Williams dominated Russian Dinara Safina, 6-0, 6-3, for her 10th major championship. The Williams won this Grand Slam event title, who also won this event in 2003, '05 and '07, will assume the No. 1 ranking in the world come Monday.This Singles titles for Serena came just a day after she and sister Venus took home women's doubles title, topping Slovakia's Daniela Hantuchova and Japan's Ai Sugiyama.